Like all stereotypes, there’s a part that’s true, and another part that’s simply a stereotype. In many ways, it’s like what used to be said about Windows vs. Macs – that a reason to stick with Windows was that there were (are) more applications for that platform, which was (and still is) true, but is really besides the point in all but a few specialist areas. If there are 10 word processors for Windows and only 5 for the Mac – but you only need one – does it really matter? Right now, I’m in the process of writing about the Nexus 7 and the iPad, a sort of battle of the two-year-old tablets, given that neither of my tablets are current models. First thing to note is that, for the things I want to use a tablet for, there are apps for both. (Both platforms claim about a million apps on their respective app stores.) In most cases, I am using iOS or Android versions of the same app: Gmail, Chrome, Facebook, Twitter, etc. These apps tend to be similar between platforms, but not quite identical. In some cases, there are useful features in the iOS version that are lacking in the Android version, but in other cases, the Android version has a feature not present in the iOS version (though either could change in a soon-to-be-released update). 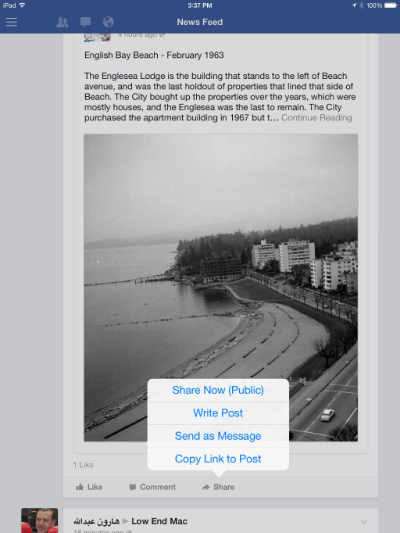 For instance, if I want to Share a Facebook post using the Facebook Android app – like Facebook in a web browser on a computer – gives options to share it on my wall, to a Page I manage, to a Group I like, or in a personal message to a FB friend (No longer! FB is removing the messaging features from its mobile versions.) This is very handy to me, as I often want to share something in the Squeezebox Circle group or Spartacus Books page rather than on my wall – or to send it directly to someone else. Once again, there are versions for iOS and Android – and once again, the iOS version is prettier than the Android version. 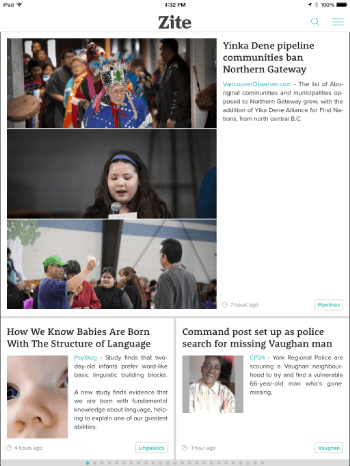 See below – first Zite on the iPad (iOS), then Zite on the Nexus 7 (Android). Zite on the iPad is using a magazine style layout; for additional stories, I need to pull the next page from the right. 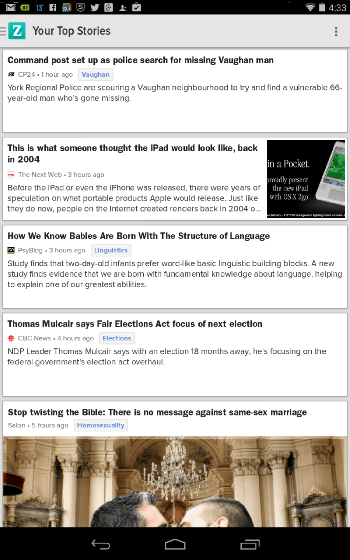 On the Nexus 7, it’s much more of a list with fewer images – scrolling down reveals more stories. What I want to do is scan a large number of headlines and brief descriptions quickly in order to find the relatively few stories I want to read in full. I can do that much more easily in the Android version. As well, the Android version lists the stories in chronological order – when I see one that I remember from last time, I can move on to the next topic. The iOS version sort of does that, but not quite. In order to fit the magazine style layout, stories get placed out of chronological order. I might see a story from yesterday, but it may be followed by more recent stories. There’s been some reports suggesting that iOS and iOS apps are more prone to crashing than Android and its apps. That’s been my experience as well. Not long ago, the iOS Facebook app froze on me. As well, there are a number of features in Android – the system-wide back button or the ability to install replacement virtual keyboards, for instance – that I prefer to iOS. On the other hand, Apple keeps a tight rein on the apps that get distributed by its App Store – and its harder to install apps from elsewhere onto an iOS device. The result is that iPhones, iPads, and iPod touch devices are nearly entirely malware free. Google initially made it easy for anyone to post an Android app onto its Google Play Store, which meant there were a lot of copycat apps and malware apps available there. They’ve tightened up their rules, but it’s easy to install Android apps from other sources. The result is that there’s a lot more Android malware and crapware around (sort of like Windows). But while Android has gotten a reputation for malware (sort of like Windows), the reality is that most of it is on apps distributed by third-party, often Chinese app stores. Users who limit themselves to “official” sources are almost as safe as iOS users. I agree, but as I noted above, most Android malware come from third-party sources; users who stick to apps from the Google Play store or other reputable sources are generally not affected by Android malware.